Warmquest is pleased to offer two of the finest snow melting solutions on the market. Our Tuff Cable and Hott-Wire products have been installed worldwide, providing snow and ice melting on government, commercial, industrial, and residential projects. Let’s take a look at the differences between these cables. 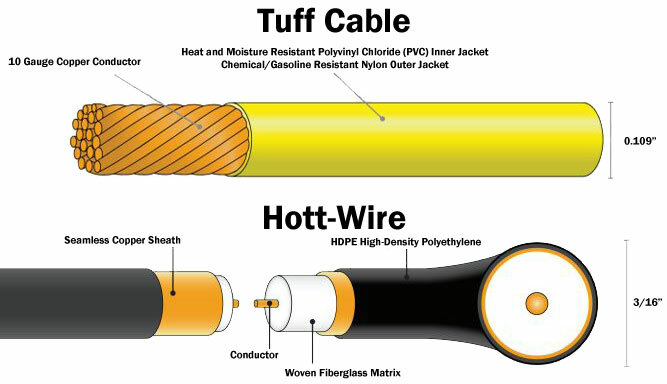 The largest difference in how these systems operate is that while Hott-Wire is a traditional line voltage heating cable, Tuff Cable is a low voltage heating system. Hott-Wire is powered directly, the input voltage is passed right on through the cable. Hott-Wire can be operated on input power of up to 600V. Low voltage Tuff Cable uses a step down transformer in the control unit to convert the input line voltage power low voltage. Tuff Cable can operate on up to 277V, with no more than 65V running through the actual cable. Related to the low/line voltage difference, the controls for the systems differ. 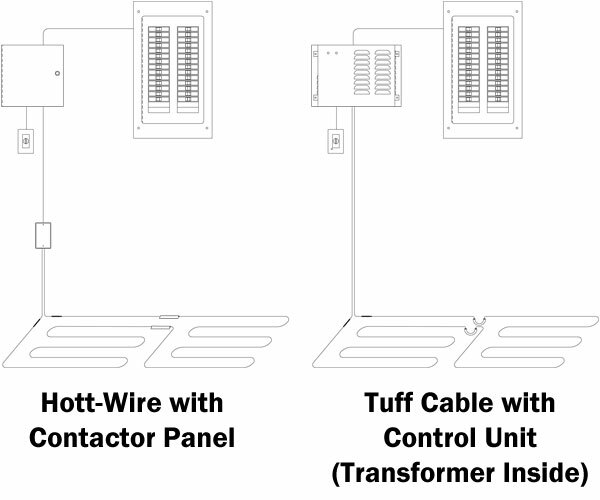 Tuff Cable utilizes a state of the art control unit, which houses a transformer to operate the system. Hott-Wire relies on a GFEP (Ground Fault) protected relay panel or contactor panel to power the cables. Both systems can utilize our full range of sensors and activation devices. Tuff Cable is backed by an industry leading 25 year warranty. This product has been in use since the late 1970’s and has a long track record of tireless performance. Hott-Wire includes a 10 year warranty. For most snow melting applications, the cables are installed similarly. The biggest difference being that Hott-Wire comes in fixed lengths, with factory attached cold leads and the heating cable cannot be modified in the field. There are many stock lengths available and we can provide custom sizes. Tuff Cable can be cut to length in the field and the cold leads are attached onsite. This allows greater flexibility for installers working with the Tuff Cable. Spacing of the cables is also different. Warmquest uses regional climate and weather data to determine how much heat is needed to effectively melt snow and ice. This data helps us determine how closely to space the cables during installation to achieve optimum output. Based on the differences in the cables, Tuff Cable is typically spaced 3”-6” apart and Hott-Wire runs are usually installed on 6”-9” spacing. This is different with each job and your Warmquest expert can help you determine the spacing needed for your system. To protect our cables in concrete installations, we provide what we call jumpers for installation whenever the wire crosses an expansion or crack control joint in the concrete pour. The jumpers are designed to protect the cable if the concrete shifts along these cracks. While both styles of jumpers protect the cables, Tuff Cable jumpers take advantage of the cable’s flexibility to provide the best protection available. This allows properly installed Tuff Cable to withstand even the most dramatic movement in the concrete. Both of these great cables can be used in retrofit snow melting installations to heat existing surfaces. Based on the different sizing of the cables, the requirements for saw cuts are different. For retrofit Tuff Cable installations, saw cuts in the asphalt or concrete are to be ¼” wide by 1” deep. Hott-Wire retrofits require a ⅜” wide by 1.5” deep cut. When installed properly these systems enjoy long lifespans and little maintenance thanks to their solid state nature. In the event that shifting ground, heaving concrete, or other acts of nature result in damage to the heating cables, both Hott-Wire and Tuff Cable can be repaired. This process involves sending a signal down the wire to trace and identify where the break is located so that it can be repaired. Tuff Cable is both easier to trace and simpler to repair. As the premier snow melting option, Tuff Cable systems tend to cost more than Hott-Wire systems. This is dependent on a great many factors including size, purpose, and location. We recommend getting a customized quote from one of our experts to better understand the cost differences between these two products. Still not sure which product is for you? Contact our experts and get information tailored to your project.